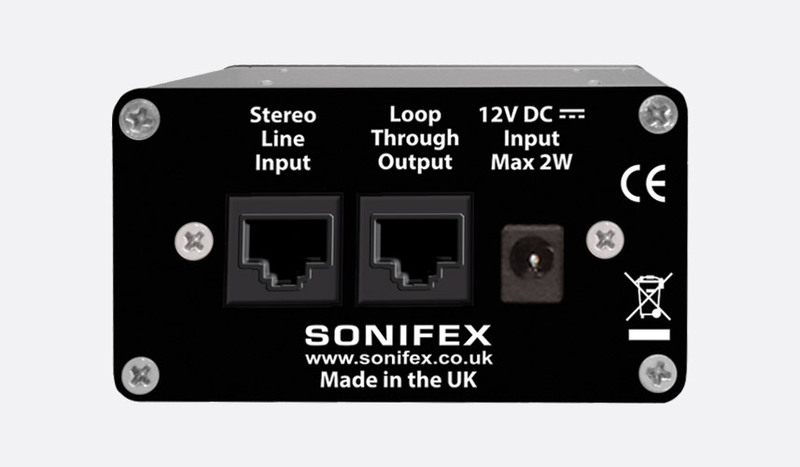 Sonifex AVN-PA8, AVN-PD8 and AVN-PM8 are audio interfaces which give the user the capability to route and mix audio signals such as analogue, microphone or AES67 inputs to either analogue, AES3 or AES67 outputs. This unit offers eight analogue stereo line inputs and eight stereo line outputs. In addition, sixteen additional channels of I/O can be accepted from AoIP based on AES67, as a subset of RAVENNA. The front facing panel of the AVN-PA8 has all visual references and user interfaces but no I/O. A brightness controllable OLED display and corresponding jog wheel with directional keys allows the user to navigate and alter settings within the menu subsets. Four buttons to the left of the screen give access to 'Menu', 'User', 'Inputs' and 'Outputs' options whilst a set of multi-coloured illuminated references give the user immediate indications of AoIP, Ethernet, Alarm, Clock, AC PSU and DC PSU statuses. A recessed rest button performs a hard reset in case of problem, and a push power button can be found on the far right side. The rear panel houses all of the I/O connectivity of the AVN-PA8 including two 25-pin D-sub connectors with AES59 analogue pin-out for stereo input channels 1 to 4 and 5 to 8. These inputs are paralleled with eight RJ45 connectors using 'StudioHub' pin-out. Output connectivity uses the same configuration as the input section. GPI/O can be accessed via 15-pin D-sub connector and two RJ45 connectors enable the 1GB network compatibility, with the upper of the two sockets being the configuration and control port and the lower being the AoIP port. A SFP (small form-factor pluggable) connector allows an alternative interface, such as fibre, to be used as the AoIP port, however the use of this input cannot be in conjunction with the AoIP network port on RJ45. An AC IEC power inlet is positioned to the right of the rear panel with 2A anti-surge fuse access. A DC power supply can be connected to the 4-pin KPJX 12V DC input at the same time as the AC power inlet. The AVN-PA8 will then automatically switch between the two power sources or load share as required. Each of the portals can be supplied in different versions: As standard they have a front panel display to show product information and for editing basic IP functionality and they use XLRs and D-types for rear panel connectivity. There are 3 other I/O and front panel display options available - AVN-PA8D, AVN-PA8T, and AVN-PA8TD. AVN-PA8D has the same specifications as the AVN-PA8 with the addition of an input and output display on the front panel with metering on two distinct TFT displays. Metering can show as one of 9 different metering scales and there is a summary view of all input channels with a detailed view of any selected stereo pair. Phase metering is also displayed per stereo channel. AVN-PA8T has the same functionality as the AVN-PA8 however it has terminal block connectors located on the rear panel, for all physical inputs and outputs as opposed to D-type and RJ45 connectors. This unit has all the connectivity of the AVN-PA8T and the front panel display of the AVN-PA8D. The AVN-PD8 is essentially the same unit as the AVN-PA8 however in place of analogue I/O on D-sub connections, eight stereo digital AES3 inputs and eight stereo digital AES3 outputs can be found on D-sub sockets with AES59 pin-out. The eight RJ45 connectors using 'StudioHub' pin-out remain the same. AVN-PD8D has the same specifications as the AVN-PD8 with the addition of an input and output display on the front panel with metering on two distinct TFT displays as per the AVN-PA8D. AVN-PD8T has the same functionality as the AVN-PD8 however it has terminal block connectors located on the rear panel, for all physical inputs and outputs as opposed to D-sub and RJ45 connectors. This unit has all the connectivity of the AVN-PD8T and the front panel display of the AVN-PD8D. Like the AVN-PD8, AVN-PM8 has the same feature set as the AVN-PA8 however is has been manufactured to house eight microphone/line level inputs on 3-pin XLR sockets. AVN-PM8 has the addition of microphone pre-amp gain adjustment and 3mm red LEDs indicate a presence of phantom power on each microphone input. Outputs are on D-sub sockets with AES59 analogue pin-out and are paralleled with eight RJ45 connectors using 'StudioHub' pin-out. AVN-PM8D has the same specifications as the AVN-PM8 with the addition of an input and output display on the front panel with metering on two distinct TFT displays as per the AVN-PA8D. AVN-PM8T has the same functionality as the AVN-PM8 however it has terminal block connectors located on the rear panel, for all physical inputs and outputs as opposed to D-type and RJ45 connectors. This unit has all the connectivity of the AVN-PM8T and the front panel display of the AVN-PM8D. 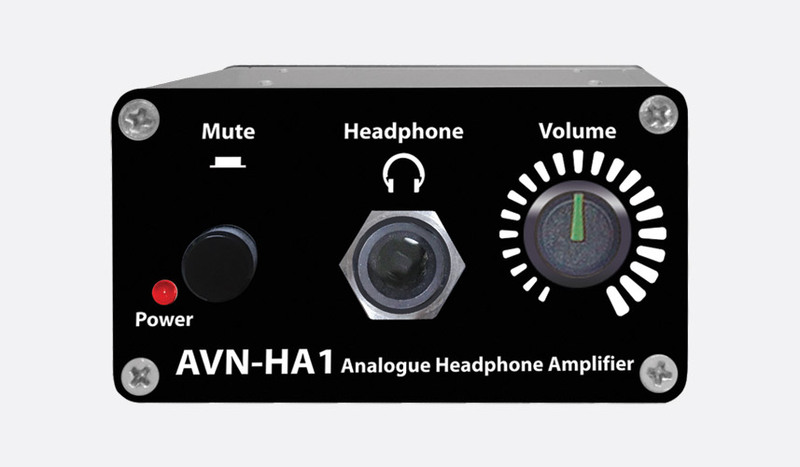 The AVN-HA1 headphone amplifier has been designed specifically to connect to the AVN-PA8 and AVN-PM8 models to provide headphone amplification with volume control. Up to eight AVN-HA1s can be connected to each AVN audio interface via RJ45 connection for multiple headphone feeds. The front facing panel has the volume control, a 6.35mm headphone output and a latching mute switch. Power status, which can be provided via the RJ45 input or external DC PSU is identified by a red LED on the front panel. The rear panel has an input for the DC power inlet, as well as RJ45 connections for stereo line input and loop though output. The AVN-HD1 has the feature set of the AVN-HA1 however it is for digital I/O and therefore only compatible with the AVN-PD8 models.